A federal judge sentenced four women to 15 months probation and a $250 fine each on Friday as a result of charges stemming from leaving out jugs of water and cans of beans for migrants crossing the U.S.-Mexico border. The women were convicted in January of operating a vehicle without a permit at the Cabeza Prieta National Wildlife Refuge in southwestern Arizona. They were also convicted of entering a wildlife refuge without a permit and abandonment of property after a U.S. Fish and Wildlife officer stopped them in August 2017. The women -- Natalie Hoffman, Oona Holcomb, Madeline Huse and Zaachila Orozco-McCormick -- all volunteer for the organization No More Deaths, which is dedicated to saving the lives of immigrants crossing into the United States illegally. 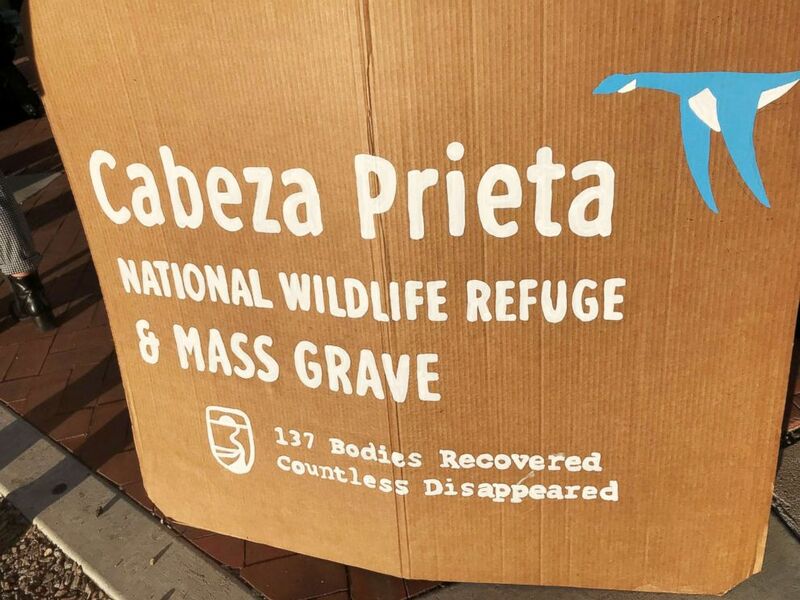 Supports of four humanitarian aid volunteers facing criminal charges for dropping off water at the Cabeza Prieta National Wildlife Refuge display this sign, showing the number of recovered human remains found in the remote desert wilderness. "The border crisis in this country is a matter of life and death," Huse said in a statement from the organization after the sentencing. "History will not favor those on the wrong side of it. Our border policy continues to push people into remote and dangerous parts of the desert." The border crisis continues to be a focal point in the country as President Donald Trump argues the need for a border wall between the U.S. and Mexico. Trump forced a shutdown of the government in December and January over $5 billion in funding for the wall -- a signature campaign promise. The president declared a national emergency on Feb. 15 in order to secure some funding for the wall. Trump returned to the theme on Saturday in a freewheeling, campaign-style speech at the Conservative Political Action Conference in National Harbor, Maryland. "The lawless chaos on our southern border provides a lucrative cash flow to some of the most dangerous criminal organizations on the planet," Trump told the audience. "Deadly cartels constantly, daily, hourly, violate our borders to flood our cities with drugs that kill thousands and thousands of our citizens, violently. What are these people talking about when they talk about the border, keep it open? Keep what open? Have you been there, have you seen?" 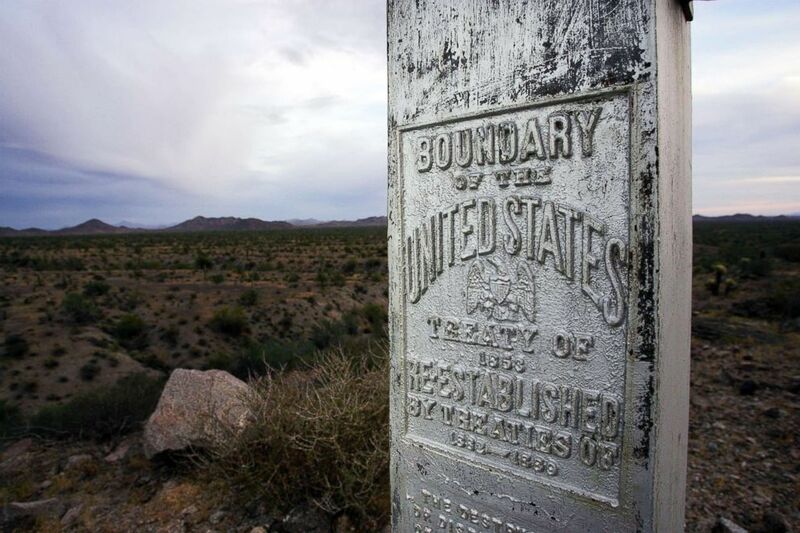 A monument marks the boundary between Mexico and the United States at the Cabeza Prieta National Wildlife Reserve on March 27, 2006 near Ajo, Arizona. No More Deaths reaffirmed a commitment to its cause in a statement following the sentencing. "We may have been found guilty but the real crime is the government’s deliberate policy to use 'death as a deterrent' at the US/Mexico border," it said. "The criminalization of those acting in solidarity is a classic example of the ramping up of an authoritarian regime. "The humanitarian work that has ultimately brought us here today will continue to address the border crisis until there are no more deaths," it added. The four women will be allowed to serve unsupervised probations. U.S. Magistrate Judge Bernardo Velasco, who also delivered the sentence Friday, wrote in his decision in January that a federal law requires people who access Cabeza Prieta to obtain a permit for entry, which would require the applicant to remain on designated roads and not leave anything within the refuge. Prosecutors decided to forego prosecution of four other women -- Caitlin Deighan, Rebecca Richeimer, Zoe Anderson and Logan Hollarsmith -- after they agreed to pay a $250 fine on Feb. 21. Scott Warren, another member of the so-called "Cabeza 9," is facing three federal felony charges for allegedly harboring two undocumented immigrants, according to The Arizona Republic. He has denied those accusations. His trial gets underway in May.